The current state of this room is a real 1970’s treat full of dark green floral wallpaper and some funky beige wood paneling. My husband likes to joke that if I saw the same floral wallpaper at Anthropologie, I’d gladly pay $200 a roll for it today. But alas, it must go, because I’m on a mission to make every room mine. We’re taking down the horrendous wood paneling wall and replacing it with some white shiplap. I know that someday 30 years from now a young woman will buy our home and scoff at our decision to install this trendy wall feature in the very same way I’m rolling my eyes at wood-paneling. At least I’m self-aware though, right? The other three walls are going to get a fresh coat of paint in Benjamin Moore’s Kennebunkport Green. I’ve been dying to use this color somewhere in our house and I think this room is perfect for it. We didn’t have a guest room in our old apartment, so I’m starting from scratch on the furniture front. We’ve also never owned a headboard in any form during the 10 years Mike and I have lived together so I’m most excited about this addition to the room. 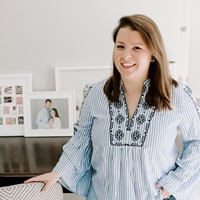 My friends at Raymour and Flanigan helped me pick out an upholstered headboard in a perfect linen navy hue to contrast the white shiplap walls, and I love the chic nailhead details around the simple frame shape. In the supporting furniture arena, I have a few nightstand options from Target earmarked, but really love the wood and white combination of one in particular. I thought it would be fun to update the handles though with a brass and leather pull. I have a vintage chair that used to hang in this room before the renovation that I may recover too; I’m obsessed with the Caitlin Wilson oversized gingham fabric and may use it for this project. To pull it all together I want to keep the bedding crisp and simple for guests with white sheets, a pretty block print navy and white coverlet my mom found for me at HomeGoods (thanks Mom!) 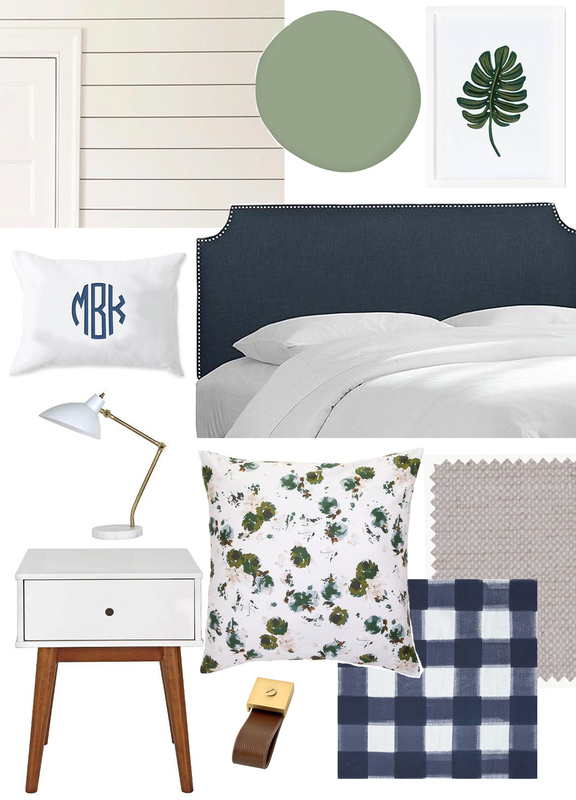 and maybe a fun monogrammed pillow to finish off the bed. I’m also hemming and hawing about investing in some Biscuit euro pillows in the Bloomsbury print — the palette was my inspiration for the room and I think they just might make the whole look. I’m still undecided on lamps and artwork, so design-minded friends, let me know if you see anything fabulous that I need to know about! I can’t wait to share more as we make progress on this room, and will share more details about the larger master bedroom renovation next! The Download – 5.26.17 A Master Bedroom Makeover.